One form of E number that is commonly added to our foods and drinks is the preservative. But why does food need to have preservatives added and what types of preservatives are used? In its most basic sense, preservatives are added to food to preserve, or lengthen, their shelf life. They’re mostly used in processed or packaged foods to retain their freshness and ensure the products remain in an edible state for longer. Natural products, like fruits and vegetables, only remain fresh and edible for a certain period of time, before they go brown, decayed and off. They’re fine if you’re able to buy and use the products within this time range, but not if you need to them to last longer. That’s one of the reasons why processed and packaged foods have become popular. Preservatives are added to the products during the manufacturing stage, which results in increased longevity. This helps the product remain on supermarket shelves for longer, but also helps the product remain edible for longer after the packet has been opened or part of the food has been used. They work by inhibiting and preventing the growth of mould that would other badly affect the deterioration of foods. 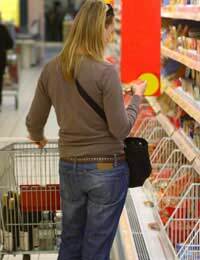 With so many foods and drinks ending up on supermarket shelves for lengthy periods of time, it’s essential they don’t go off before consumers buy and subsequently eat the products. It’s not just the time they spend on the supermarket shelves that influences the use of preservatives though. With processed foods that are manufactured, the manufacturing, packaging and even transporting of foods – especially if it’s coming from foreign shores – can all take a while. After all that effort has gone into producing the products and shipping them to their destination, supermarkets don’t then want the food to go off really quickly. The use of preservatives may seem to be synonymous with the advent of processed foods, but actually they’re not such a new invention. The art of preserving food has existed for centuries, just in different way. For example, salt and vinegar have been used for a long time to preserve products. Salt was traditionally put on meats and vinegar has been used a pickling agent on various foods to help extend their life. In today’s modern preservative world, ingredients such as salt and vinegar are still used, but alongside lots more synthetic and manmade preservatives too. Cast your eye down the list of E numbers in the preservative category – E200 to E299 – and you’ll come across all sorts of weird sounding names. E249 – Potassium nitrite. This preservative is commonly used to preserve meats, such as corned beef, bacon and ham. E220 – Sulphur dioxide. This preservative is used with dried fruits, to help maintain their look, taste and flavour. E2234 – Nisin. A type of preservative that is widely used with dairy products, such as cottage cheese, clotted cream and cheese, as well as tinned products. E214 - Ethyl 4-hydroxybenzoate. This preservative is used in a wide variety of foods, such as preserved, glace or crystallised fruits, fruit pie fillings, fruit juices, mackerel, salad cream and jam.